Many Hillary Clinton supporters in New York kept their allegiances quiet. Hillary Clinton is greeted by supporters at a Women for Hillary meeting on April 5 at Medgars Evers College in Brooklyn. Until Tuesday night, I had assumed that my neighborhood, Cobble Hill, Brooklyn, was overwhelmingly supporting Bernie Sanders. Sanders bumper stickers and T-shirts outnumbered those for Hillary Clinton by what seemed like 20 to 1. A couple of times, I thought about putting my baby daughter in a Clinton onesie—whatever my hesitations about Clinton’s candidacy, I love the idea of my girl’s first image of an American president being female. But I always hesitated, not wanting to invite playground harangues from local dads about Goldman Sachs and the Fed. When I looked up Cobble Hill on the nifty New York Times tool providing neighborhood-by-neighborhood results, however, it turned out that Clinton won the immediate area around my apartment by 59.4 percent. A block over, she won by 72.5 percent. She won all around me. A lot of Clinton supporters, evidently, have been keeping quiet about their allegiances. There are a couple of explanations for this. Sanders fans seem to be more enthusiastic, though it takes a certain amount of enthusiasm to vote in a primary at all. Registered independents couldn’t vote in New York’s closed primary, particularly given the absurd, undemocratic October deadline for switching parties. But I think there might be something else at work as well: an optical illusion that the candidate with the most white male support had the most support, period. I had let myself mistake the loudest people for The People. I’m not trying to deny that the Sanders coalition is diverse or to erase the many passionate women and men of color who supported him. But the fact remains that according to exit polls, Clinton won every racial and gender demographic except white men. And somehow, I’d become convinced that, in my own backyard, their preferences were far more widespread than they really are. I’ve heard anecdotally from other women who’ve kept their support for Clinton somewhat quiet, because they assumed they were in a minority. On Tuesday I spoke to Bushwick resident Savannah Cox, a 26-year-old writer and researcher at the New School, a famously progressive Greenwich Village university. “As a Clinton fan, I have had to be diplomatic even though I am patronized,” she says. “I am honestly sick of it.” She describes one male friend who offered to speak more slowly so she could fully grasp his point about Clinton’s complicity with the fossil fuel lobby. Cox says she has stopped talking about politics with her friends: “I can’t do it. I don’t want to engage.” (Bushwick’s neighborhoods were divided between Sanders and Clinton.) Again, this is a single anecdote, but it makes me think I’m not alone in being reluctant to advertise my support for Clinton. I’m a little abashed that I missed what was going on in my own community. One of the most searing experiences of my political life was covering Ohio during the 2004 election, where it seemed as if the entire civilized world had mobilized to stop George W. Bush. I followed celebrities like Steve Buscemi, Julianna Margulies, and Matt Dillon as they campaigned door-to-door, often surprising people who weren’t quite sure why the canvassers looked so familiar. On election eve, Bruce Springsteen performed “No Surrender” for tens of thousands of elated Kerry supporters in Cleveland. I sobbed, unprofessionally, in the press stands. I was sure our national nightmare was over. The next day was one of the worst of my life. People took many different lessons from Kerry’s defeat, but one that I learned was not to mistake a massive, passionate crowd for a majority. At least, I thought I’d learned it. Tuesday night, I learned it again, less painfully. Brooklyn is full of a certain kind of archetypal Sanders voter—young, hip, highly educated, and ideological. 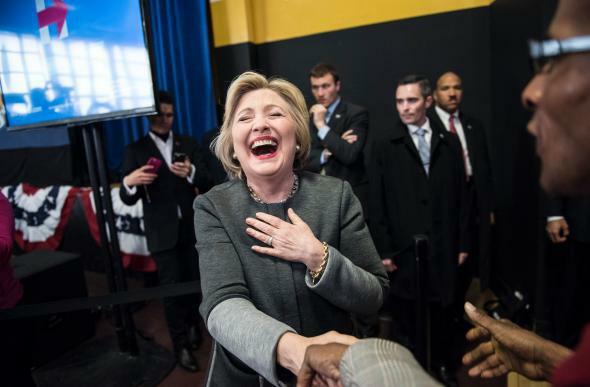 But in Brooklyn as a whole, Hillary Clinton beat native son Bernie Sanders by 20 percent. The borough was with her, even if it didn’t always feel like it.